No skill is learned without the proper tools. In the worlds of education and business, one of the primary tools for learning is books. Books build strong readers; strong readers become strong learners; strong learners become strong leaders. But for the 32 million U.S. children growing up in poverty, books are scarce. The simple reality is children need books to learn to read. In fact, a rich supply of books improves reading performance regardless of a child’s economic status or even the literacy level of their parents. We Latinos are hopeful people, gente llena de fe y de esperanza, for whom education is extremely important. Nearly 1 in 4 students in public schools are Hispanic, and all of us have a stake in supporting those who are serving our young children, both in and out of school. With you, I celebrate our triumphs – the number of Hispanic students enrolled in college is up by more than 50 percent from 2008-2009. But I challenge us to do more, since only 15 percent of Latinos hold a bachelor’s degree or higher. As First Book’s director of Hispanic engagement, my mission is to help those who serve Latino children access educational resources that help their kids thrive in school and beyond. 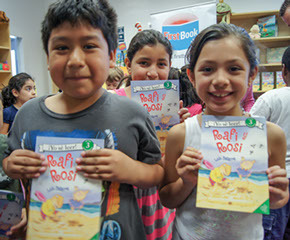 A nonprofit social-enterprise, First Book connects more than 130,000 schools and programs serving low-income families with a rich supply of age-appropriate and culturally relevant books and educational resources. We know, and every study confirms, that strong reading skills are critical to a child’s success. But kids won’t simply take to reading just because they’re told to. They need a way in. In a recent survey of more than 2,000 educators from First Book schools and programs, 90 percent of respondents indicated that the children in their programs would be more enthusiastic readers if they had books with characters, stories and images that reflected their lives and their communities. Yet 73 percent of the classrooms and programs had few, if any, books featuring Latino culture and heritage. In response to this need, First Book created the Stories for All Project – a commitment to increase diversity in children’s books by building a vibrant and growing market for diverse authors, stories and characters reflecting and celebrating Latinos, African-Americans, Native Americans, Asian and Pacific Islander Americans, LGBTQ families, those with special needs and more. Early this year we also launched an unprecedented collection of Latino culture books and distributed more than 270,000 of these books to schools and programs serving Latino children in need. We created a best-in-class, 50-book Latino Culture and Heritage collection for elementary schools and reached 35,000 new programs serving primarily Latino children. In addition, we worked with HarperCollins Children’s Books to create and introduce the first-ever bilingual version of Goodnight Moon/Buenos Nochas, Luna, which is now available through First Book. More than ever before, we’re looking to reach other educators and program leaders like Linnette. We’ve joined hands to support the work of mission-driven networks like the League of United Latin American Citizens (LULAC), the National Council of La Raza (NCLR) and Abriendo Puertas. But we know there are many schools, non-profits, faith and community-based programs that desperately need books for the kids they serve – books in which kids see themselves, and others. Please join us in bringing much-needed books to children in your community. Here is how you can help: Make sure schools and programs serving children in need in your community are signed up with First Book. Classrooms and programs serving at least 70% children from low-income families are eligible to receive free and reduced cost books. Registration is free at www.firstbook.org/libros. Raise funds to get more books into the hands of children in need in your community by hosting a Virtual Book Drive. Go to www.firstbook.org/vbd to learn more. Make a gift to First Book at www.firstbook.org/donate. Just $2.50 provides a child in need with a new book. If your corporation wants to help bring books to children in specific communities, contact me. A donation to First Book will help your funds go farther. Together, we can enrich the lives of our children and ensure that they all have the opportunity to read, learn and succeed. Roxana Barillas is the Director of Hispanic Engagement for First Book.She can be reached at rbarillas@firstbook.org and on Twitter at @Librosrock. Challenges have paved her path – from growing up in poverty-stricken Puerto Rico to warding off men’s chauvinism. 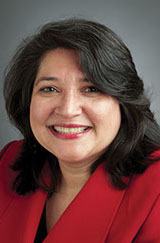 Carmen Delgado Votaw has overcome them all to run at the fore of the women’s rights movement. Holding both official and civic positions, Carmen has contributed to many of the freedoms and liberties women worldwide today enjoy. Yet, her accomplishments and personal motivations remain largely unsung. Growing up in economically strained Puerto Rico, Carmencita arranged corn grains to form letters. Pencils were in short supply. To make a living, her father, Luis Oscar Delgado, employed his entrepreneurial aptness. A seventh- grade teacher who used to throw erasers at inattentive students, he also ran a bookstore and sold anything from shoes to jewelry to insurance. Her mother, Candida Paz, a sedate woman, taught third and fifth grade, organized school plays and often invited to dinner students and colleagues, who lived in places too remote to afford commuting home every evening. Carmencita’s life took on a new trajectory when her father died and the balance of her mother’s world tilted. At that time, a high school student in the capital of San Juan, she started working to support herself and her ailing mother, whose $84-a-month teacher retirement check was far from enough. As the girl grew into an adult, her earlier plans to attend university withered. A close family friend, however, resuscitated them by introducing Carmen to Puerto Rico University president Jaime Benítez and his wife Lulu. Benítez presented Carmen with a full waiver of the otherwise insurmountable college tuition. Carmen excelled in her studies. In two short years, she earned a secretarial degree from the university’s business school. Upon graduation with highest academic honors in 1954, she joined the Government Development Bank for Puerto Rico. There her career took off. On Valentine’s Day in 1959, Carmen attended a party that became a watershed in her personal life. That night she met Gregory Votaw, a gringo who had recently arrived from the mainland to advise the Puerto Rican government on economic development. He liked her. She liked him. He invited her to join him and his colleagues in his apartment for a small gathering afterward. She said that Puerto Rican girls do not go to strangers’ places. Two-and-a-half years later, they married. Another six months down the line, the young family moved half a world away to Iran, where Gregory helped devise a development plan for the Muslim country. There Carmen learned Farsi well enough to bargain over the price of lavish rugs, visited archeological digs and felt snow on her mocha-toned face for the first time. Iran hosted many firsts for Carmen. Iran’s orphanages, where she met with untended children, ignited flickers of what later burst into her involvement into the rights movement. Carmen gathered a group of foreign women to take the orphans home to play and care for them. Later, she persuaded the shah and the mullahs to allow foreigners to adopt Iranian orphans. When in 1962 the family returned to the United States, it embraced the church with new vigor sparkled by its staunch fight against segregation. The following year Carmen and Gregory attended the Martin Luther King March on Washington. Years later Carmen presided over the women’s commission that included King’s wife. The two became close friends. “Coretta taught me that injustices to anybody in the world are injustices to you personally,” she said. In 1972 President Jimmy Carter anointed Carmen to the International Women’s Year Commission. Later she cleaved the responsibility of heading the National Advisory Committee for Women with Bella Abzug. Abzug attracted most of the media exposure while Carmen hustled behind the scenes. Parallel to that, Carmen presided over the Inter-American Commission of Women at the Organization of American States, where she shouldered a gargantuan responsibility to represent the interests of American women of all classes and races. By the mid-1970s the movement for women’s rights had swept the world. In 1975 it cohered in the first United Nations Conference on Women in Mexico City “in the most machista place on earth,” as Carmen described it. That the United States and a number of other countries appointed males to head their delegations still amuses Carmen, who, a couple of months shy from 79, basks in the reverence of several generations for her impassioned leadership. Carmen’s career stirred into yet another direction in 1979, when President Carter fired Bella Abzug, a fellow member of the National Advisory Committee on Women. More than half of its members resigned in protest. Carmen was one of them. 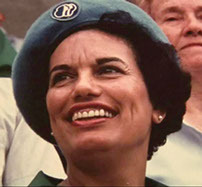 Soon she joined the Girl Scouts of USA, directing the 3.5 million-strong organization’s relations with the government. The move cemented her distinct social roles of a women’s rights advocate and of a loving mother who applied the Scout teachings at home and divvied up once gender-sensitive chores among her three children, sons Stephen and Michael and daughter Lisa. Lisa always opted for tasks such as mowing the lawn. Carmen has locked Girl Scouts of USA in a special corner of her heart. She shares many life-defining moments with it. Receiving the Hispanic Heritage Foundation Award for Education in 1996 was one. It celebrated her roots and achievements in planting and nurturing the seeds of self-respect and self-fulfillment in girls and women. The rest of the country may be a bit slow on the uptake, but there has been regular if sometimes bumpy progress. Carmen has shown the nation that patience and perseverance can and should be an essential virtue. 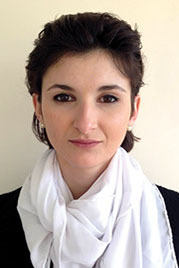 Dima Vitanova writes for Hispanic Link.